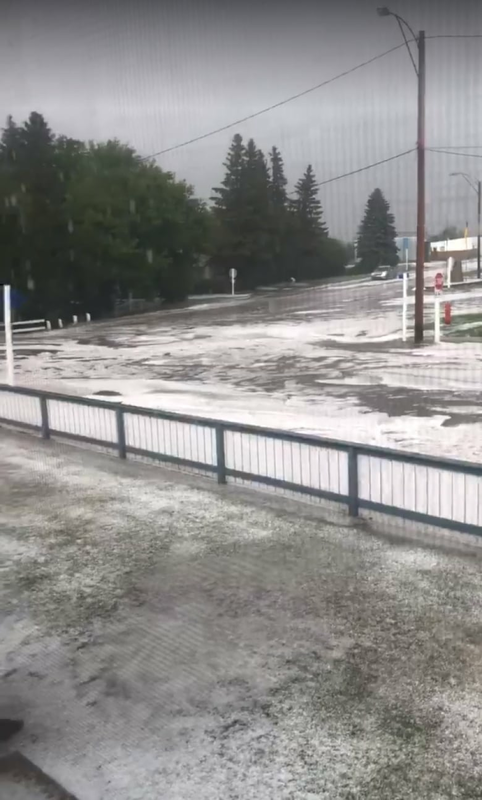 A hail storm and flash flood caused some excitement in the town of St. Louis, Sask as residents captured video of it on Tuesday. The town's location high above the nearby South Saskatchewan River meant the precipitation was able to quickly drain and leave the houses of residents completely unharmed by flooding. 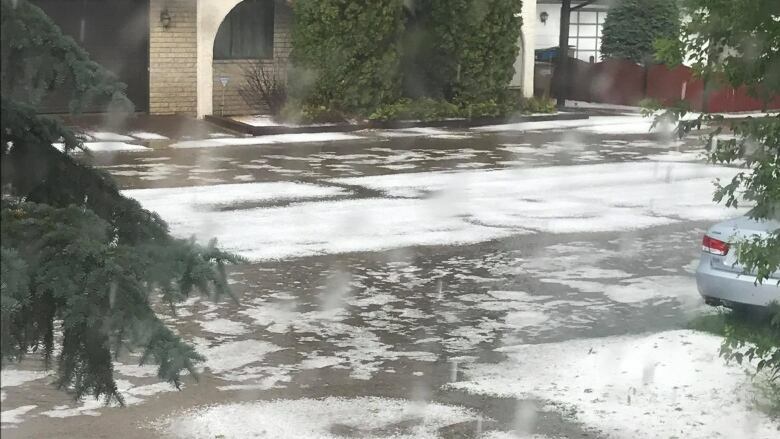 However, the rush of water and white hail made for dramatic viewing for Dayna Zimmer and four children in her home as it hit around 2 p.m. on Tuesday. It came as a surprise to Zimmer since the sky had been cloudy and overcast, but not dark or threatening. Rain fell for a few minutes, and then the hail started. "When it goes really, really, really heavy like that — like, I've never seen that — but heavy like that you'd think it would only last for maybe five,10 minutes but this one lasted, like the rain kept coming," Zimmer said. 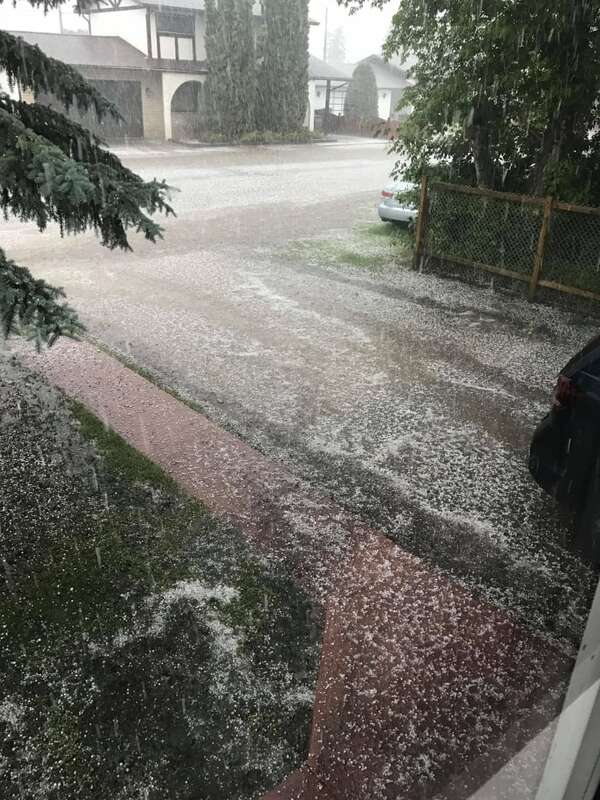 A deluge of water rushed down the street towards the river as the hail lasted about half an hour before abruptly stopping. "The hail lasted long enough to make the ground and the road white but then it was raining as well as hailing, so the rain was flooding...That's how much rain came in," Zimmer said. Zimmer's house didn't flood, and she said she thinks her van hasn't been dinged by the hail, but her garden and her neighbour's gardens were ruined. Zimmer had about 50 tomato plants. When her husband went to check on them, he told her they were gone. "You look outside, it's flattened. Yeah, it's destroyed," she said. Zimmer said the storm seems to have been localized just to the town of St. Louis — her mother lives four minutes away and didn't get an onslaught of rain. The owners of the Riverlot Orchards Winery just outside town told CBC they hadn't gotten hit either.